I've been looking for a side dish to take the place of potato salad, both in terms of filling, starchy-feeling comfort food as well as ease of preparation. I came across the idea for this in an old church fundraiser cookbook- few of the ingredients were GAPS legal, so I modified it and the result has been a big hit with my family. 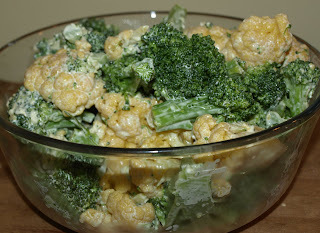 To make the salad, steam one head of cauliflower and about the equivalent amount of broccoli. Dress it as you would have for potato salad. I make a simple dressing from olive oil, GAPS mayonnaise, salt, and some lemon juice or apple cider vinegar. This would be acceptable early on in intro, once whole egg is introduced. Later, you can add chopped Bubbie's pickles and chopped onions or whatever else suits your fancy.